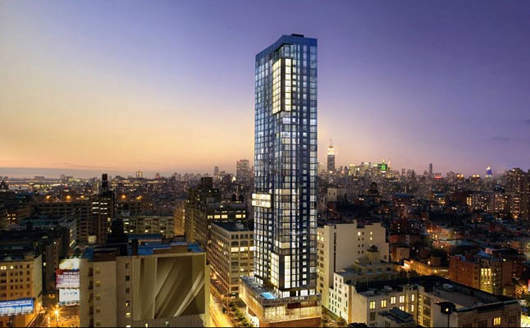 Trump® Hotel Collection, the next generation of luxury hospitality, today announced that Trump SoHo™ New York, its first hotel in Downtown New York, will open its doors on Feb. 1, 2010. Located at 246 Spring Street in the fashionable SoHo (South of Houston) district, the dramatic, 46-story, 391-room glass tower designed by Handel Architects neighbors numerous art galleries and chic boutiques. In addition to unrivaled views of the city’s spectacular skyline, the Hudson River, Statue of Liberty and Empire State Building, cutting-edge design by Rockwell Group, and spacious suites, Trump SoHo will offer such Trump Hotel Collection hallmarks as world-class dining at Quattro Gastronomia Italiana, The Spa at Trump® with New York’s only luxury hammam, and the signature services of the Trump Attaché™. Trump Hotel Collection, which embodies the vision of Donald J. Trump and his three grown children – Donald Jr., Ivanka and Eric – has been raising the bar on the top-end travel experience with a style of customized service unmatched in the market. Trump SoHo New York will join the flagship Trump International Hotel & Tower ® New York and sister Trump Hotel Collection properties Trump International Hotel & Tower® Chicago and Trump International Hotel™ Las Vegas, both of which opened in 2008, as well as Trump International Hotel™ Waikiki Beach Walk®, opening Nov. 16, 2009. With Trump SoHo New York, renowned Rockwell Group has created an experience reminiscent of the grand hotels of the early 20th century, but with a modern twist. Reflecting the artistic SoHo environment, the design of the hotel balances materials and finishes that are raw and rich, such as the juxtaposition of bronze with highly finished leather paneling and walnut screens. The overall design emphasizes the verticality of the space, with vertical screen walls and tall, slender columns. The tile treatment and wood grains used throughout enhance this elongation. A palette of chocolate browns and soft blues is employed alongside soft grays and beiges, with touches of gem tones. Entering the property, guests step through two sets of towering bronze doors, their interiors creating a momentary vestibule of stitched dimensional leather as one moves into the dramatic, two-story conservatory lobby. Four columns covered in rich brown and metallic blue Venetian plaster support ceilings over 22 feet high. Whether day or night, a screen wall along the windows will modulate light and movement from outside on the street to change the mood of the space. Pompeii stone plinths around the columns add elemental intrigue with fire and water features. Jalo Sahara paving stones placed in an irregular pattern accentuate movement and echo the neighborhood’s cobblestone streets, while patchwork hand-tufted wool area rugs will complement the soft blue of the columns. The Library, designed by Rockwell and displaying an array of lavish art and design books by Taschen, will overlook the lobby through a wall of glass. Its modern fireplace, wine rack and custom cherry-blossom wallpaper will create a subdued, intimate setting perfect for a cup of a coffee, cocktails or light fare. Adjacent to the hotel, a beautifully landscaped Urban Plaza with decorative lighting will extend the length of the block, providing a tranquil setting for relaxation. Trump SoHo’s 391 guest accommodations will blend classically inspired interiors with contemporary New York design by Rockwell, while offering extraordinary views of Manhattan. There will be 132 deluxe one-bedroom suites, 245 deluxe guestrooms ranging from 422 to 905 square feet – many of which can be combined to create over 70 spacious two-bedroom suites – and three one-of-a-kind Spa Suites. The top floors will be crowned with 10 spectacular, two-bedroom penthouse suites – more than any other hotel in New York – ranging from 1,194 to 2,331 square feet. The Terrace Penthouse will be a two-bedroom, two-bathroom duplex suite with an expansive terrace granting breathtaking views of Manhattan from the Brooklyn Bridge to the Empire State Building to the Hudson River. Some Penthouses are equipped with Sub-Zero refrigerators, dining tables and other special amenities. Trump SoHo will be the only hotel in New York with furnishings by Fendi Casa, including sofas, chairs, headboards, side tables, and a beautiful bench at the end of the bed. All bedrooms will feature custom-made bedding by Bellino along with each guest’s preference from the Trump® Pillow Menu. Throw pillows by Aviva with a eucalyptus motif, along with cashmere throws, will lend subtle accents of blue and gray. Guestrooms have wool carpeting throughout, with a hand-tufted wool rug under the bed for added texture. A millwork hearth unit features a sliding door, built-in lighting and bookshelves. Each bathroom will feature custom-designed fixtures and hardware, with both a shower with rain showerhead and a separate tub, many with windows offering stunning city views. Vanities wrapped in hand-stitched leather will have countertops of slate-like marble with handpicked Marmara stone from Turkey gracing the walls. In addition to flat-screen televisions, three dual-line telephones and wireless high-speed Internet access, all guestrooms and suites feature the innovative Control4® Suite System. This cutting-edge technology allows the guest to easily control lighting, room temperature, TVs, music and drapes with a single remote, and conserves energy while the guest is out of the room. Quattro Gastronomia Italiana is one of Miami’s top dining destinations, known for its authentic Northern Italian cuisine and impeccably sourced ingredients, sophisticated design and European-style service. For the New York location of Quattro in Trump SoHo, New York-based Studio A Design has outfitted the sleek multi-level space in a palette of emerald green and tan. As in Quattro Miami, black granite, beveled mirrors and buttery leather seating combine to create an elegant yet modern dining experience. Accessible via the lobby as well as a separate entrance, Quattro will seat 190 guests for breakfast, lunch or dinner. A second mezzanine level includes two private dining rooms, and the flexible space is ideal for private and semi-private events. Created by the team behind South Beach’s hottest night spots, Bazaar will be the place to see and be seen while enjoying impeccable cocktails and playlists by renowned DJs. Luxuriously textured wood walls have a split-face finish, with a simple polished dark charcoal concrete floor continuing the raw and rich design elements in this posh lounge designed by Rockwell. Bar d’Eau will open seasonally on the lushly landscaped, 6,000-square-foot Pool Deck, located outdoors on the seventh-floor spa level and designed by DiGuiseppe Architect. The blue Italian mosaic-lined pool will feature a cascading waterfall, along with three private cabanas, fountains and Bocce court, offering a relaxing atmosphere by day. At night, Bocce meets bottle service as Bar d’Eau becomes Downtown’s hottest new destination – the ideal place to enjoy al fresco cocktails above the city streets. Miami-based restaurant and hospitality group KNR will operate Quattro, Bazaar, Bar d’Eau and The Library. Their accomplished team will also provide in-room dining for Trump SoHo—including in-room chefs in the penthouses upon request—as well as food and beverage for all events, from corporate meetings and cocktail parties to weddings and galas. The 11,000-square-foot Spa at Trump, located on the seventh and eighth floors, will be home to two separate luxury hammams for men and women, offering traditional services of heat, scrub and relaxation. Designed by DiGuiseppe Architect, The Spa at Trump will have nine private treatment rooms—both indoor and out—and wet rooms, along with secluded outdoor relaxation areas. Hotel guests will enjoy the state-of-the-art fitness center with Technogym equipment. Those seeking the ultimate in relaxation may opt for one of three luxurious Spa Suites on the eighth floor, with their private, connecting couples-sized treatment room. Every moment of the spa journey caters to the individual guest’s desires, expressed through his or her individually selected Trump® Personal Intention: Calm, Balance, Purify, Heal or Revitalize. Spa-goers will benefit from the highly personalized services of a Trump Spa® Attaché, who will guide them through each step of the experience, from assisting with the selection of a robe, slippers and locker, to preparing infused elixirs and customizing iPod music selections. The Spa at Trump features premier skin and body care brands like Shiffa, Tara and Jamu, and will feature a menu of treatments exclusive to Trump SoHo. With more than 12,000 square feet of elegant meeting and event space that can be customized for any occasion – more than any other hotel in SoHo – Trump SoHo will cater to Downtown’s most prestigious functions. The entire third floor is dedicated to five meeting and event spaces, with the flexibility of sub-dividable rooms for simultaneous meetings or large group meetings. The windows feature a unique ceramic frieze treatment for privacy, with retractable panels to darken rooms as needed. The majority of Trump SoHo’s meeting rooms have elegant separate pre-function spaces ideal for coffee breaks and pre-dinner cocktail receptions. All of the larger meeting and event spaces can be adapted for banquet, theater, classroom or U-shaped seating. Overlooking Spring Street, the 2,040-square-foot Hudson Square room will showcase the neighborhood through 20-foot, floor-to-ceiling windows. 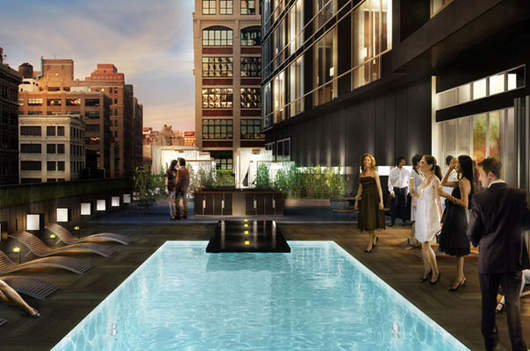 Connected to Hudson Square, the 1,289-square-foot, covered Spring Terrace will overlook the landscaped Urban Plaza and invite everyone to enjoy a cocktail in the night air year ‘round. At 3,900 square feet, the SoHo Ballroom, the only Downtown luxury ballroom with floor-to-ceiling windows, can accommodate up to 400 guests. It can be divided into two smaller spaces, SoHo One and SoHo Two, accommodating 175 and 200 guests, respectively. Meanwhile, on the top floor, the 1,800-square-foot, Handel-designed SoHi will be one of the ultimate event spaces in Manhattan, with unparalleled views of the city, the Hudson River, and The Statue of Liberty through its 15-foot, floor-to-ceiling windows. A full array of business services and equipment will support the hotel’s event capabilities, including 100% wireless Internet and mobile telephone coverage throughout the hotel for all major carriers – with a total of 100MB of customizable bandwidth allocation, more than any other hotel in New York City – and the latest audiovisual technology, including videoconferencing and high-definition televisions.